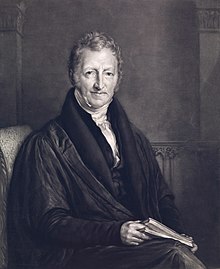 ^ "Malthus, Thomas Robert". Retrieved 4 January 2019. 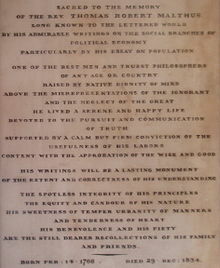 ^ "Malthus TRM Biography". Retrieved 13 February 2010. ^ McCulloch, John Ramsay (10 March 1827). "A Review of Definitions in Political Economy by the Rev. T. R. Malthus". The Scotsman: 1. ^ Malthus, Thomas Robert (1 December 2011). 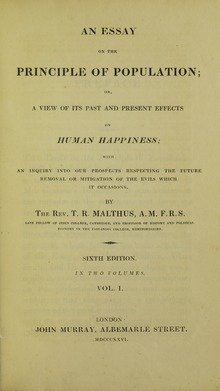 An Essay on the Principle of Population (Two Volumes in One). Cosimo, Inc. pp. 5–11. ISBN 9781616405700. ^ "Avengers: Infinity War-Thanos, the Malthusian Purple Dude is the Best Villain of MCU". News18. Retrieved 27 April 2018. ^ Orr, Christopher. "'Avengers: Infinity War' Is an Extraordinary Juggling Act". The Atlantic. Retrieved 27 April 2018. Malthus, Thomas Robert (1999). Gilbert, Geoffrey (ed.). An Essay on the Principle of Population. Oxford world's classics. Oxford University Press. p. 208. ISBN 978-0-19-283747-9. Retrieved 12 February 2010.